This two day self-discovery, eye-opening, fun and empowering accredited Mastery of the Five Elements Core Essence and Character kinesiology course encompasses Traditional Chinese Medicine in a practical, effective and heart-loving way. Presented in a light, fun and engaging manner by its developer, Denise Robinson, you will delve into the universe, nature, the body and your soul at the Five Element level. The core of your essence will shine out during these two days of Five Element Balancing and Constitutional Profiling. The bodies beautiful Hara in conjunction with muscle testing is used to tap into the subconscious mind and body to determine imbalances. You will thrive with other course participants as you tap into all the Elements and gain a true understanding of Fire, Earth, Metal, Water and Wood in the universe around you, the body within you, your mind and thoughts, character and how you look and see things plus all your favourite things. You will enjoy exploring and experiencing the Essence of each Element including Fire – Excite (loving ourselves), Earth – Nurture (nurturing ourselves), Metal – Refine (respecting ourselves), Water – Be (reassuring ourselves), Wood – Do (asserting ourselves). A deeper understanding will be developed with lots of ah ha profound moments of joy and acceptance of self – just beautiful. 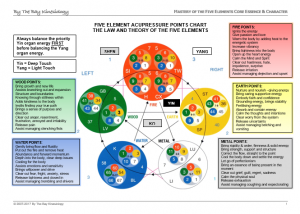 In the Mastery of the Five Elements Core Essence and Character course Element Acupressure Points are used to shift energy around the Five Elements to gain optimal balance in the body. You will learn about the Spirit / Psyches of the Five Elements including, Fire – Shen (Mind & Spirit), Earth – Yi (thought or intention), Metal – Po (Physical Soul), Water – Zhi (willpower, drive, ambition) and Wood – Hun (life plan, sense of purpose and sense of direction). This process is significant, transformative and brings deep healing. A clear, detailed, comprehensive and easy to use step-by-step 120+ page manual accompanies this course. Mastery of the Five Elements Core Essence and Character course gives you permission to tap into your gorgeous heart, and to accept and embrace exactly who you are. Be amazed and excited at how the Five Elements affect everything inside and outside of ourselves. In depth look and understanding of the Traditional Chinese Medicine (TCM) Five Elements (Fire, Earth, Metal, Water, Wood): essence, meridians, organs, sense, tissue, fluid, appearance, expression, spirit/psyches, emotions, feeling, ways of reacting, basic need, spiritual issue, virtues, way to correct imbalance, physical indications of imbalance, emotional/spiritual indications of balance and imbalance. The Five Elements in Nature: movement, season, climate, developmental stage, colour, taste/flavour, odour/scent, time of day, direction, planet, grain. Constitutional profiling of all the Five Elements to discover your own constitution and how to determine other people’s and how this impacts your life. Profiling comprises of: body type (hair, eyes, face, complexion, body antics), movement, traits, self-talk, coping response and life issues, and all your favourite things! This process if very profound and changes your perception, it provides an appreciation and understanding of yourself and others with compassion. Element Acupressure points (ie. Fire, Earth, Metal, Water, Wood points), for each Element are taught in meaningful, practical ways which are quick, easy and effective to use to provide deep healing, energy, grounding, balancing, relaxation and flow, direction, strength, power and transformation. These can be a balance in themselves! 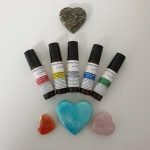 Detailed element remedy information and practical application for: Element Acupressure points; Essential Oils; Element Balancing Oils & Sprays; Crystals; Colour; Sound; Flower Essences; Nutrition; Affirmations; Activities/Spiritual Practices; Emotional Stress Release (ESR); Oracle/Healing Cards; Energy healing; Nature’s Healing Chi; Plus more! Full step by step laminated balancing procedure including an easy to follow template session sheet for the Five Element balance and the Constitutional Profiling. Practical application of the full Mastery of the Five Elements balance including using all remedies on other workshop participants. Pre-requisite: Kineasy Intro Course or equivalent. Confident muscle testing, circuit locating and circuit retaining mode with stacking is required. Students will be required to demonstrate competency in written and practical assessments with a 75% pass mark. Six Element case studies and three constitutional profiling case studies must be completed post course to obtain proficiency. A Certificate of Attendance will be issued via email for 16 hours after completion of class hours. Once competency requirements have been met a Certificate of Proficiency will be issued via email for 31 hours. 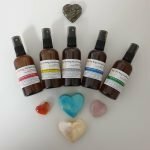 To purchase any of our beautiful heart-centred products used in our eye-opening Mastery of the Five Elements Core Essence and Character Kinesiology Course which include our Mastery of the Five Elements Core Essence and Character Course Training Manual, Five Element & Meridian Emotions Chart, Element Balancing Sprays & Oils, Crystal Reference Chart, Essential Oil Chart, Colour Therapy Chart or Clearing Spray please click on the highlighted words or icons below to be directed to the shop.